Yesterday a Shalom.Kiwi reader, Natalie Owen, posted a series of hate-filled anti-Semitic rants in response to one of Shalom.Kiwi’s articles. Normally these kinds of abusive rants would be removed, but on this occasion we thought they served a useful purpose in demonstrating what anti-Semitism looks like. This is because Natalie helpfully managed to cover just about every anti-Semitic trope that characterises modern-day anti-Semitism. Shalom.Kiwi then replied, identifying this comment as anti-Semitism as outlined by Rabbi Sacks in his excellent speech at the European Parliament. I’ve seen that post, and it’s propaganda for people like you. I’m not anti-Semitic at all. I am Jewish myself. Palestinians are the true Semites, so seems to me that Zionists are calling the kettle black again. I’ve even seen thousands of Jews in New York standing up to Zionists saying they have no right to be occupying Israel. Delete my comment if you like. But at least I know the truth. And many others. Calling me anti-Semitic means nothing. It’s a term made up by Zionists themselves. Know the difference? Natalie made several further similar comments after these, which we have included below. While we wouldn’t normally like to dignify such racist abuse with serious attention, we think it would be useful as a learning exercise to examine how her comments illustrate most manifestations of modern-day anti-Jewish hate speech. Natalie, for the most part, tried to disguise or legitimise her hate-speech with the smokescreen of anti-Zionism. However, the mask slipped, as is often the case. Anti-Zionism might not be the same as anti-Semitism, but very often there is an overlap. Demonisation: for example, making wild comparisons between Israel and the Nazis or Isis, or as Natalie did, blaming Zionists for the world wars and just about every other bad event in history. Double-standards: this means judging Israel by a higher standard than is applied to other countries. It is hard to imagine a country that Natalie would judge more harshly than Israel. Delegitimisation: to deny the right of Jews to a Jewish state, in other words, to self determination. It is fairly clear from her comments about “Israehell” and her ravings about hating Zionism that she does not believe that Jews have the right to a homeland. Natalie started off quite carefully using the word “Zionist” in her conspiratorial ramblings, but a few times she let her guard down and slipped the word “Jew” in. It didn’t matter, we knew what she meant. Her words could have come straight from anti-Jewish propaganda of 1930s Germany. It is disturbing to see this again in 2016 New Zealand. If Natalie is to be believed, Zionists have been incredibly busy over the last few centuries, starting both world wars, somehow being responsible for the death of 20 million Christians, toppling Libya and Iraq for profit, causing the fighting in Syria, killing 20 million Bolsheviks, committing more genocide, making up the Holocaust (see below) and even secretly being Isis. They even, according to Natalie, got under the skin of Napoleon Bonaparte, which is quite an achievement considering that he died 76 years before the Zionist movement was formed. But Zionists, to anti-Semites like Natalie, are a special kind of super-villain. In her own words: “You (Zionists) are the beating heart of everything wrong in this world”. Roger Fowler of Kia Ora Gaza has also jumped on this bandwagon, blaming Israel for all the ills of the Middle East and comparing it with Isis. It is hard to imagine a more offensive lie; the concept that Jews somehow invented the Holocaust, or inflated the numbers of those who perished in the death camps, for some machiavellian purpose. Holocaust denial, which its propagandists misrepresent as “historical revisionism,” has become one of the most important vehicles for contemporary anti-Semitism. It is the invention of a collection of long-time anti-Semites and apologists for Hitler. To members of the Jewish community whose families still carry the trauma and loss of those dark years, this malicious fabrication causes a great deal of pain. This is one of the oldest forms of anti-Semitism. In medieval times Jews came to be seen as the people who rejected Jesus and crucified him (although it was the Roman authorities who ordered and carried out the crucifixion). By the 11th -14th centuries, Jews in Europe were widely persecuted as barely human “Christ-killers” and “Devils” and forced to live in all-Jewish ghettos, forced to convert to Christianity to avoid death, torture, or expulsion, though many secretly practiced Judaism after their conversions. Even into the 20th century Christian theology was used to prepare the ground for Europe’s systematic murder of Jewry. Hitler was able to quote Protestant ‘Father of the faith’ Martin Luther to justify genocide of Jews. 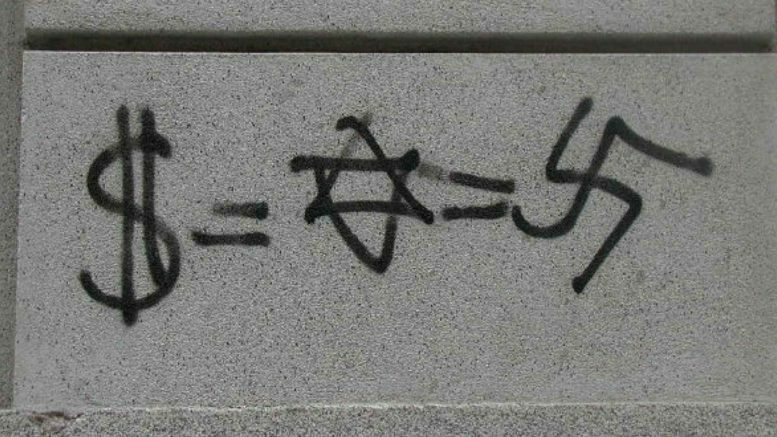 Sadly, anti-Semitism is still prevalent and increasingly so in some countries. While New Zealand has to date not had a serious problem with this issue, social media has opened up a whole new avenue for anti-Semitism to flourish. We know that hate starts small, and must be challenged if it is to be prevented from growing. We encourage everyone who reads this to challenge anti-Semitism, whatever its form, whenever they see it. …you’re side swiping the issue here, focussing on what I’ve called them, but not seeing what they are doing. That quote is exactly what they are… It’s not about race, it’s what they stand for. Although.it is odd that mostly people from this particular race are hell bent on ruling the world. Don’t you think?